Is Your Child’s Nap Mat Toxic? Last year, I was looking to buy my daughter a nap mat for pre-school and was rudely awakened to the fact that many nap mats contain toxic flame retardant chemicals, which studies have repeatedly linked to various health hazards in animals. I couldn’t bear the thought of my daughter’s face laying on this nap mat, breathing in these chemicals on a daily basis. I can’t say I was surprised by this finding–unfortunately, many baby products, clothes, and furniture contain harmful chemicals that can be leached into the air and absorbed into the skin by direct contact. But, many parents probably don’t think of nap mats as a potential hazard for their children. I wanted to share with my readers the science behind the concerns about nap mats (specifically those made of soft foam and plastic materials)…and offer relatively easy solutions to the problem. First of all, how do we know for sure that nap mats contain flame retardants? In 2013, The Center for Environmental Health (CEH) commissioned a study of 24 nap mats containing polyurethane foam purchased from major retailers like Target and Amazon. These nap mats were sent off to a Duke University lab for analysis. All but two of the nap mats were found to contain flame retardants. These mats contained 10 different flame retardant chemicals (or chemical mixtures) and 19 of the nap mats contain more than one chemical. Only 11 of the nap mats were specifically advertised as flame resistant. The most common flame retardant was triphenyl phosphate (TPP), in 18 nap mats, followed by chlorinated Tris (TDCPP) in nine mats. Eight mats contained a mixture equivalent to Firemaster 550 (which contains TPP), and eight contained the “Tert-butyl mixture.” The Washington Toxics Coalition did its own study of 14 nap mats bought in retailers in that state and found that 12 of the 14 mats contained TDCPP and Firemaster 550. In sum, most foam nap mats on the market contain flame retardants. TPP (triphenyl phosphate): Animal studies have linked TPP exposure to endocrine, metabolic, and reproductive system disruptions, including obesity, early puberty, and thyroid dysfunction (you can find two such studies here and here). The former of these two studies suggests that if TPP and similar chemicals are indeed endocrine disruptive, “this could have broad human health ramifications because they have been used for decades as plasticizers and in many other commercial and industrial applications.” A 2010 study suggests that the exposure to TDCPP or TPP might be associated with reduced sperm concentrations among human adult males. A government document published by the CDC states that TPP “is a neurotoxin in animals. When injected in cats it caused delayed paralysis” (Page 1). By the way, I’ve only mentioned a few studies here; many more have been done on TPP and Firemaster 550, which contacts TPP, and found potential harmful effects. The Environmental Working Group (EWG) lists other such studies here. TDCPP (chlorinated Tris): Recent animal studies have suggested that TDCPP causes neurotoxicity, is an endocrine disruptor and a reproductive toxicant (e.g. see here and here), and is potentially carcinogenic (see here). The WHO and National Research Council have reported TDCPP to be linked to cancer in rats (NRC report here; I could not find the 1998 WHO report on the web). TDCPP is also on California’s Proposition 65 list of substances known to cause cancer, and this report issued by the California Protective Agency lists a bunch of studies that show TDCPP to be carcinogenic and toxic in other ways. Chlorinated Tris was banned from children’s pajamas in the mid-1970s, yet it still widely used in children’s products today. Option 1: There is at least one nap mat company that has discontinued the use of flame retardants, and parents can buy from this company or otherwise do their own research to identify a safe option. The Center for Environmental Health (CEH) worked out a deal with a leading manufacturer of nap mats, Peerless Plastics, to discontinue using flame retardants. I called and verified this with the CEO back in August, 2014–he said that any nap mat manufactured as of Jan 1, 2014 will not contain any flame retardants. There is so much turnover of their product that any major retailer carrying their mats will have the flame-retardant-free stock by now. **By the way, I am not in any way affiliated with this company, and they didn’t even know I was writing this article. I am sharing this information because I think it is very useful and I believe that companies that respond to consumers’ concerns should be rewarded with business. I bought my daughter’s mat over a year ago on Amazon. You can find the Peerless Plastics Kindermat for under $18 (as of this writing) on Amazon (as well as in other major retailers). If you can convince your school to order these mats in bulk from a wholesaler and then sell them to parents at this discounted price, you can save money. This is what I did with my daughter’s old pre-school, which now carries only Peerless Plastics Kindermats and sells them to parents. Her current school has their own stock of nap mats and doesn’t require parents to buy their own–but I checked the label and saw that it was not Peerless Plastics. I asked if I could provide my own nap mat and they have no problem with this. I encourage parents to be their own advocates and work out a mutually beneficial solution with their pre-school. Option 2: Avoid foam altogether, and if the school permits it, you can opt for other materials that are not usually treated with flame retardants include polyester fiberfill, cotton, and wool. I love that there is somewhat of a happy ending to this story. The CEH and other organizations are working to get Congress to outlaw the use of flame retardents and other toxins in children’s and other consumer products. In the meantime, parents have the few options I’ve reviewed above. I bought my Swiffer many years ago when I got married, used it a bunch, and then stopped. Why? Although it’s a really convenient and easy way to clean floors, I became bothered by Swiffer’s chemical-laden solution, which, by the way, also has a very strong scent that lingers for a long time after cleaning. Then, it finally dawned on me: why not make my own solution and pour it into an empty Swiffer bottle?! Finally, the answer to my problem–if only all of life could be this easy! 🙂 And, there’s a double bonus to doing it yourself: not only is it healthier to make your own cleaning solution, but you save a lot of money! 1. 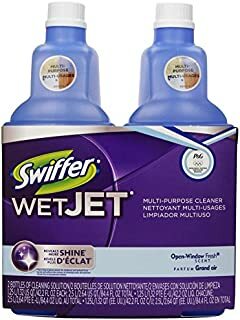 Remove the cap: I had a years-old empty Swiffer solution bottle still in my WetJet. I removed the empty bottle and tried to pry the cap off, which was a bit difficult. I used plyers to do it, and it worked! Another alternative I’ve read about is submerging the cap under hot water for 30-60 seconds and twisting it off with a towel. Either way, you will be able to remove it! Clearly, the executives at Proctor & Gamble do NOT want you making your own solution! 2. Make your own solution: There are so many ways to make homemade cleaning solution! I do it very simply for my floors: I used only distilled white vinegar and water. Easy-Peasy! Proportion-wise: I pour about 25% vinegar and then fill up the rest of the bottle with water. The proportions are not an exact science,and I’ve seen floor cleaner recipes vary from just about 1/4 cup vinegar to a bucket of water to about a 50/50 split. Experiment and see what works for you, but I like to go a little heavier on the vinegar for a more powerful solution. Done, that’s it! 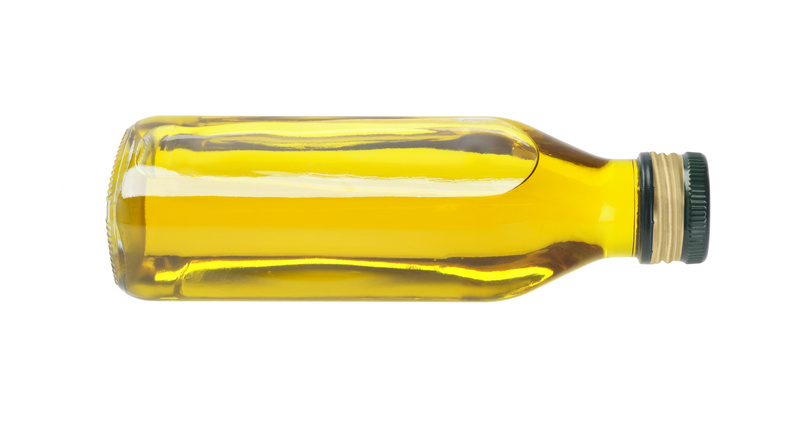 Some people like to add a few drops of essential oil (like lavender or orange) to create a nice scent. When you mop with this solution, it will smell like vinegar for a few minutes. 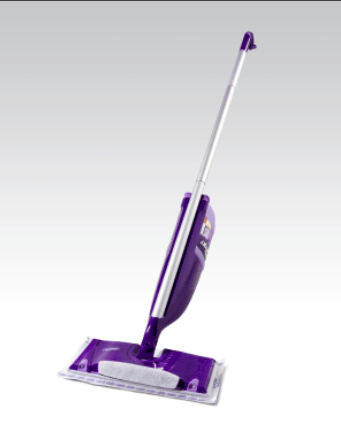 But rest assured–the smell quickly dissipates, and the solution dries quickly, making your floors ready-to-use within minutes of cleaning!! Vinegar is a natural disinfectant, by the way, and I use it to clean almost all surfaces and floors. Warning: avoid using on marble (apparently, it can eat at the stone, though I haven’t witnessed this personally after using it on my marble counter tops) and hardwood floors (it can strip them). For these surfaces, you may consider just using water and a few drops of dish soap. Readers of my blog may recall how enthusiastic I was when I finally found the RIGHT water bottle to fit all my daily needs (I schlep one with my everywhere!). Well, the search has been on for finding the right on-the-go smoothie container, and I’ve just found it, so I thought I’d share! I like to keep my water bottles for just water, so I don’t have to worry about washing out sticky fruity stuff. For smoothies, I need something that will not spill, will fit in my cup holder in the car, keep my drink cool, and hold a nice-sized portion of smoothie along with a straw (the best way to sip!). So, when I walked into an organic juice bar recently and they served me my smoothie in a mason jar with a straw coming through the lid, I had my smoothie AHA moment! This was it: since mason jars are made of glass, there’s no leaching from plastic. Also, no more spilling my smoothie when drinking it from a cup! And it’s super on-the-go, as it fits into my car’s cup holder and even the one in my stroller (though you will have to check yours). Plus, glass is super super easy to clean in the dishwasher, and you can throw out the straw (though I often use a re-usable straw to reduce waste). If you want to keep it nice and cool, throw in some ice cubes! Want one??? They are cheap and easy to make. You can buy a pack of mason jars from Amazon, Target, or other stores. (Share a pack with a friend and/or make enough containers for the whole family!) Mine is a 24 oz. 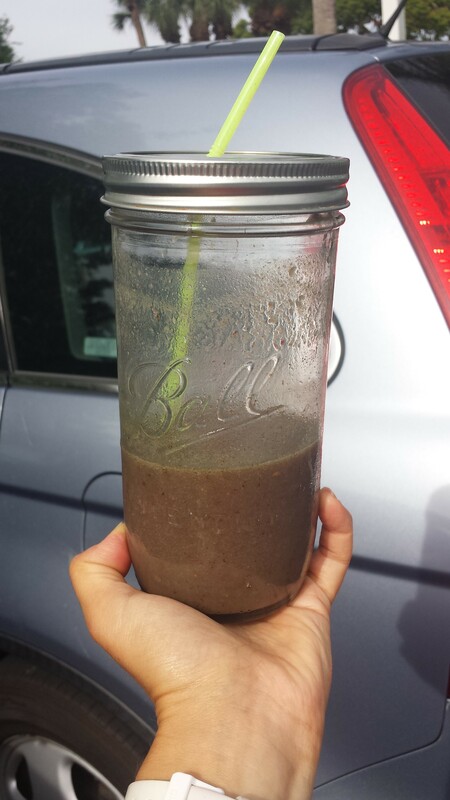 Ball Wide Mouth Mason Jar–it’s the perfect size and fits into my car’s cup holder. Then, all you have to do is use a single-hole puncher or drill to make a hole in the lid and voila–instant smoothie vessel!! These cute jars are also great for other iced drinks and for entertaining! If you prefer, you can also buy mason jars with a handle, like the boy is holding the photo, above, but these may not fit in your car’s cup holder. And, mini-disclaimer: these smoothie jars are for adults and bigger kids, since they are made of glass. Use your judgement when giving them to younger kids. My littles are sipping smoothies out of their plastic or stainless steel cups for the time being. In my previous post, I discussed Consumer Reports’ studies that have found “worrisome levels” of arsenic in rice products, including many baby foods and almost all gluten-free foods. Given these findings, it may be best to limit rice intake as much as reasonably possible. It’s hard to find rice-free baby and GF foods, so I’ve compiled this helpful list with a bunch of rice-free alternatives for every meal! 1. Breakfast Foods: Almost every GF cereal contains rice. Luckily, there are some non-rice alternatives, like plain corn flakes (I buy Whole Foods’ 365 brand) and some other corn-based cereals (make sure to read the ingredients list). I also like Udi’s Gluten-free Granola. For a hot breakfast, try oatmeal, like Bob’s Red Mill Gluten-Free Steal Cut Oats. You can also use corn grits (polenta) to make a hot cereal (add nuts and fruit for a super delicious treat, like in this recipe), or cut it into squares and serve with butter and honey, yum. I haven’t found any GF waffles without rice. But, you can make homemade waffles and pancakes using buckwheat, coconut, and other flours, including Bob’s Red Mill All Purpose Baking Flour, which doesn’t have any rice in it! I recently made these amazing oven pancakes using the Bob’s mix. 2. Bread: Sadly, I have yet to find a packaged GF bread that doesn’t contain rice, but you can make your own, and there are lots of recipes out there like this one or this one. If you do no have celiac and you can tolerate spelt, then whole spelt bread is an option for you–I buy it at Whole Foods and the health food aisle of my local supermarket. 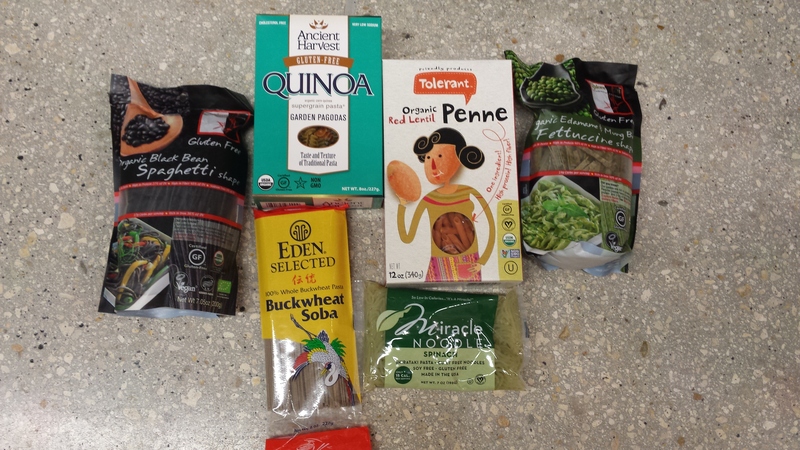 In photo: Eden Organics 100% Buckwheat Soba Noodle; Tolerant Organic Red Lentil Penne; Ancient Harvest Quinoa pasta (contains corn); Explore Asian Black Bean Spaghetti and Edamame Fettucini; Miracle Noodle Spinach Shirtataki Pasta. Each of these brands has different styles and flavors of pasta, so there is a lot to explore! SUPER SAVINGS: the Explore Asian Black Bean Spaghetti can be found in Costco in a money-saving 2lbs box! 4. Mains and Side dishes: Quinoa is an obvious choice, and switch up the colors–white, red, black–to get a variety of flavors. Polenta, which you can buy ready-made logs in supermarkets or in corn-grit form, is another alternative. I like to buy the logs, and slice them to make mini polenta pizzas (cover with sauce and cheese) or I dice them and saute them with sun dried tomatoes and garlic–yum! You can also make buckwheat as a side dish–saute with some garlic and spices, and I love all sorts of squashes as a starchy side dish that doesn’t include rice or pasta–think spaghetti pasta (just saute in some olive and garlic or add marinara) or butternut squash. 5. 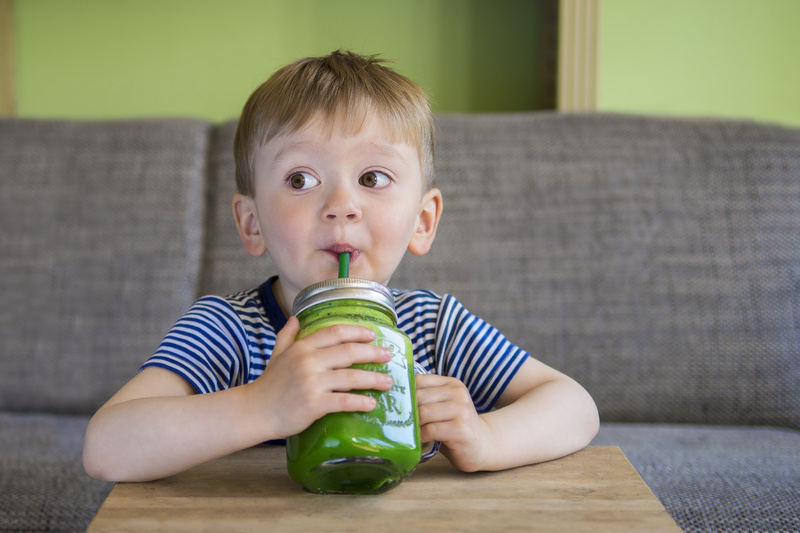 Infant cereals and snacks: Babies don’t need to start their solids-eating career with cereals. 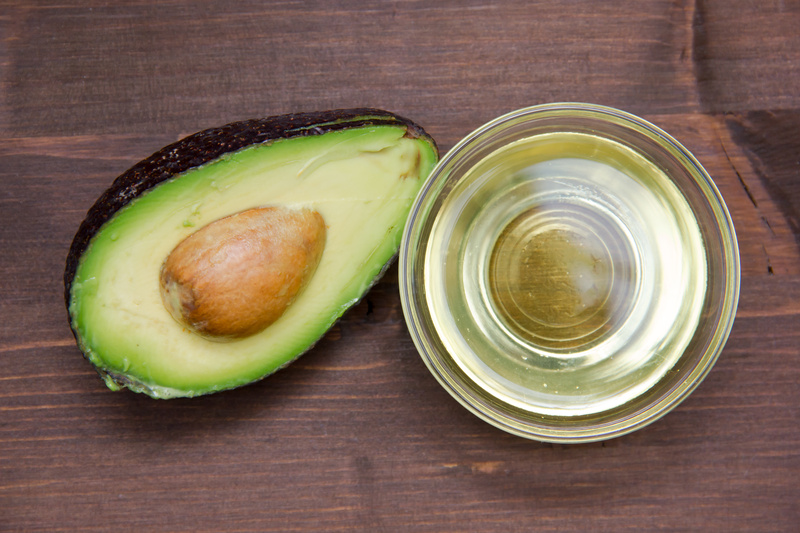 Of course, you can buy the non-rice varieties, but even better: skip the cereals and go straight to avocados, bananas, and sweet potatoes. Dr. Sears and many pediatricians support these soft, nutritious foods as great first solids for kids, and skip the cereal altogether! When it comes to snacks, like puffs, biscuits, crackers and other baby treats, so many are made with rice that it’s best to limit these altogether. One crunchy non-rice option is these coconut-based treats (they have yogurt-based ones, too). 6. 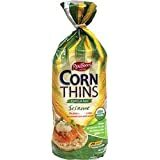 Rice cakes: The best substitute are these awesome Real Foods Corn Thins–they’re crispy and satisfying, you may even like these better than the rice version! 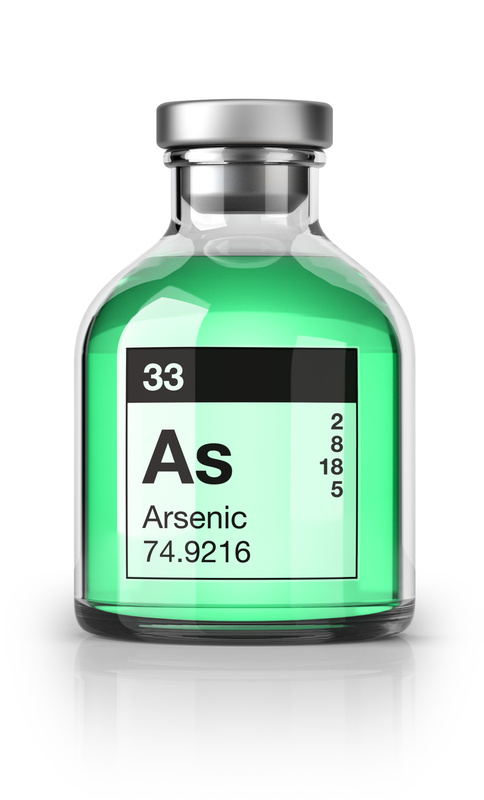 I hope this gets you off to an arsenic-free start! I’d love to hear about your favorite rice-free GF foods in the comments section.